Unlike much of the winter, April has been an unexpectedly chilly month. It's also been fairly dry, despite the rain dripping off the roof as i type this. The disastrous flooding of Tropical Storm Irene seems like it was so long ago... but the effects of the storm remain, and are still quite visible. Perhaps less evident, but just as important, are the lessons we can learn. 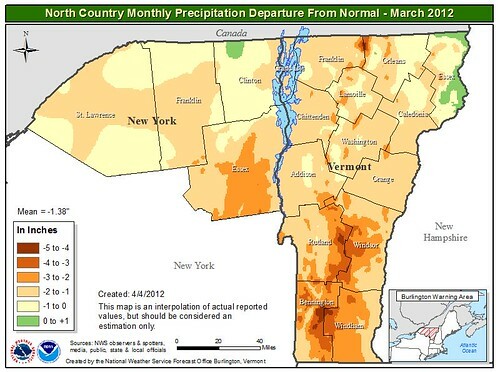 Future flooding, including that from landfalling tropical systems, will surely impact Vermont in the future. Scientists and land managers have been able to gather a great deal of data on the storm and its effects, but there is still much we don't know. 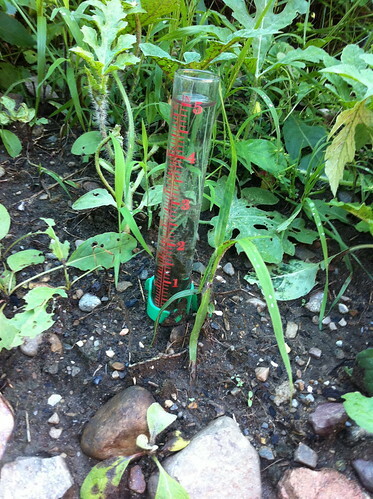 After Hurricane Irene passed through East Middlebury, my rain gage was nearly full. Unfortunately, I hadn't been a dutiful weather reporter. Because I was out of town for a couple of days before the storm (and braved the outer rain bands to race the storm north from the Berkshires the night it was rolling into town), this rain may have included a couple of thunderstorms before the main storm. On the other hand, the gage was obviously tilted, and was so full that water was probably splashing out almost as much as fell in by the time it was that full. So, I know we got a LOT of rain, but I'm not sure quite how much. I'm sure others out there have better data. If you do, sharing this data could result in better flood forecasts and improved understanding and management of Vermont's rivers. 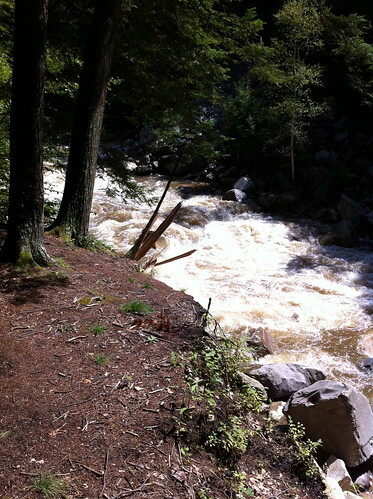 George Springston, geologist at Norwich University in Northfield Vermont, is looking for data on Irene's precipitation. In particular, data from anyone living in the mountains would be very valuable as these areas were drenched in torrential rain by Irene and are also sparsely populated. If you think you can help, I'd love to hear from you. Leave a comment on this post with as much of the following information as possible: location of your rain gage (this one is essential! ), type and diameter of rain gage, precipitation totals for the storm and any taken partway through the storm if available, and any other comments or observations. I'll make sure the information is passed on to George Springston. For the last six months, it seemed like Winter had been sleeping on the job in much of North America (except Alaska). After a very unusual October blizzard in the coastal Northeast, most of the US experienced one of the warmest, snow-free winters on record. Yes, there was snow in Vermont as well as single digit temperatures, but we experienced much less of both than usual, and intermixed with unusually warm days. 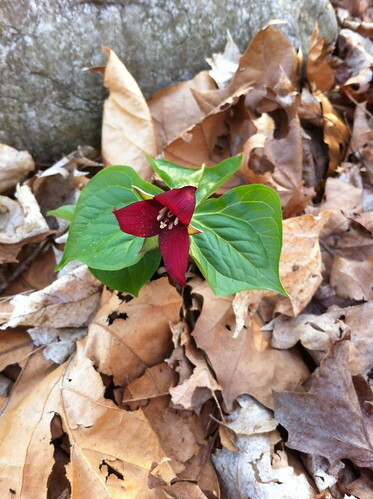 A week of unheard-of March warmth capped it all off. Sure enough, winter seemed like a no-show. 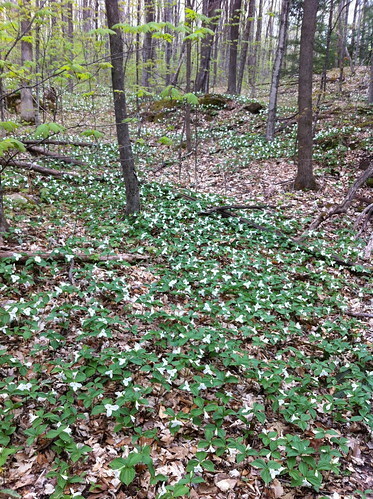 Above: Trillium in Battell Woods, near Middlebury, Vermont, taking advantage of the warm weather. 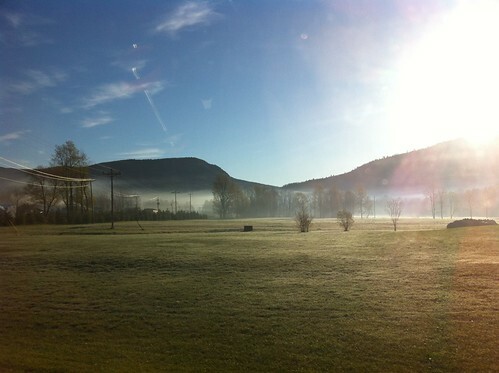 The first half of April wasn't unusually warm, and consisted of non-sticking snow, generally dry conditions, and frost settling in the hollows on a few chilly mornings. 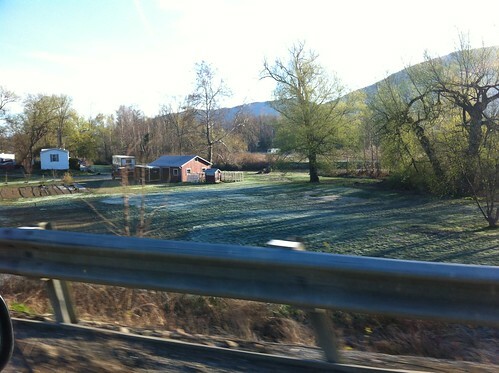 Above: Frost near Bristol, Vermont, as mid-April temperatures dropped to just around freezing. The weather has changed, though. Yesterday started out warm, but a cold front blasted into town, bringing much-needed rain but cold temperatures. Today has been overcast and the temperature in East Middlebury never got much above 40. And, barreling up towards us from the south is a powerful nor'easter. This sort of storm would bring two feet of snow if it came through Vermont in midwinter, but this late in April it will bring cold rain instead - possibly over 2 inches . In many cases this would cause flooding, but after a very dry spring I don't expect too many problems with this rain. It should really get the river flowing, though. Above: wood smoke hangs low over the dry valleys of Vermont after several months of below-average precipitation. The heavy rain of the next few days is unlikely to cause flooding. Winter isn't done after this cold storm, either. Long range forecasts indicate that there is the chance of a late blast of air from the Arctic later next week. Again, should this weather pattern have set up in January, we'd probably have gotten temperatures down around -20. Instead, this time we will expect lows that may reach 20 above zero. This is not unheard of for this time of year, but is unusual. Unfortunately many plants have leafed out, including apple trees and grape vines. If this weather pattern verifies, many agricultural interests could see serious impacts. I also wouldn't be surprised if the Champlain Valley picked up a dusting of snow, and there's an off chance we'd get that same 2 inches of snow we kept getting and losing all winter, sometime in that period. Above: the warm spring has lured this sensitive fern into sprouting - and it probably isn't going to enjoy next week's hard freeze. 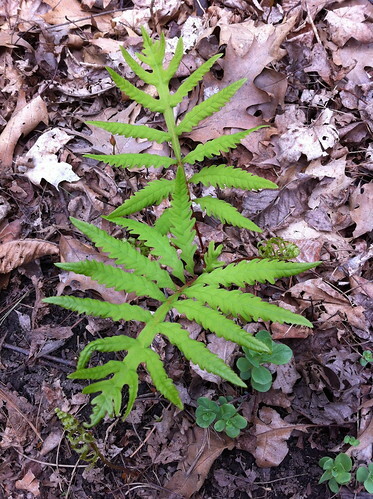 This fern has its name because its aboveground portion is very sensitive to cold. Others will be even less lucky than Vermont with winter's final temper tantrum. It is possible that the nor'easter moving through our area will dump over a foot of snow in parts of western New York. My friend was just in Buffalo and tells me many of the trees there have leafed out. A foot of wet snow in that area would rip many of these trees to shreds - just like the early snow did in Massachusetts and Connecticut last October. 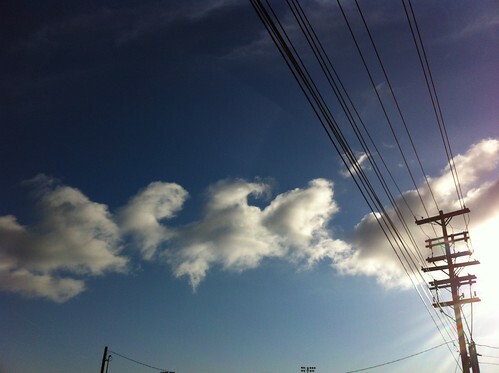 Even southern California is experiencing a late winter. Winter in coastal southern California is characterized by rain, whereas summer is very dry. The last rains usually are winding down by mid April. Like Vermont, California largely experienced a nonexistent winter. Coming into April, downtown Los Angeles had accumulated less than 6 inches of rain (a normal year sees around 14). April has already seen 1.22 inches of rain, and a late season storm forecast for next Thursday my bring up to an inch of additional rain to the area. This is rather unusual for so late in the season, though not unheard of. Like much of the East, California saw much of its 'winter' precipitation in October and April. It will be interesting to see how the plants in both areas respond to the odd weather patterns. At this point I am ready for summer, and feel that winter should just wait until next year and see if it can do a better job then. It looks like we're heading into one more week of cold, though. There have been a lot of fun developments in the world of technology-based citizen science over the past few weeks. It may seem surprising at first, but many of our largest trees occur in big cities like Atlanta. If you think about it, though, it makes sense. People don't usually go into cities to look for timber. Old cities like Atlanta don't always have to worry about losing their big trees to development, because they are already developed and have been for hundreds of years. Trees also benefit from care and fertililzer in cities (though some trees, such as California's live oaks, do not thrive with extra water and fertilizer - it depends on the species). Also, cities have less trees than forests which means the trees that do grow there have a bit more space to get truly huge. In honor of Arbor Day Weekend, Atlanta Green Spaces is hosting a fun 'art scavenger hunt'. Participants will use the Google Map (and perhaps their smartphones) to visit champion trees in publicly accessible areas, and near some of these trees they will find (and maybe get to take home) locally created art! This even seems like a whole lot of fun and combines some of my favorite things - neat uses of technology, citizen science, huge trees, and art! Unfortunately, I'm much too far away from Atlanta to participate, but if I were I'd definitely be involved with this event. Trees are great. They clean the air, and replace carbon dioxide with oxygen. They offer shade and homes for animals. 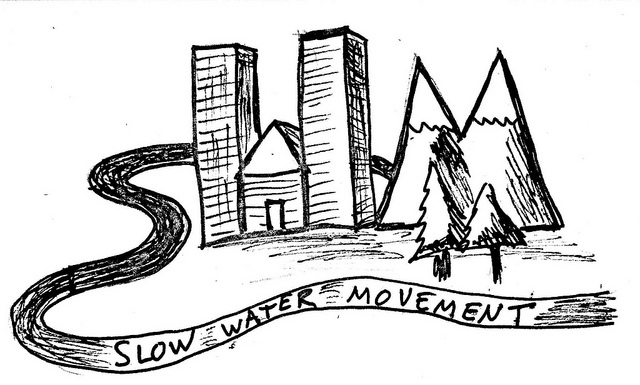 They hold the soil, protect watersheds, and improve water quality. For these reasons, among others, people like trees. People plant trees and usually this is a good thing. Except where it isn't. There are plenty of places where trees just don't belong. Some places are too dry, too windy, or too wet. Perhaps fires or floods occur too often, or the soil is too thin or nutrient-poor. Trees are great, but they don't belong everywhere. 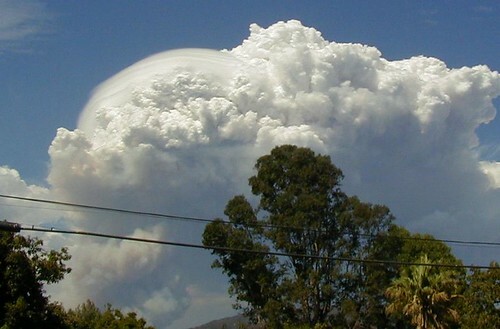 Above: smoke plume from a fire in the San Gabriel Mountains. The San Gabriel Mountains of southern Californis are a place that doesn't support a lot of trees. Those trees that do naturally occur there are special - over vast stretches of time they have adapted to survive in a place with extended hot and dry summers punctuated by torrential winter downpours, and at high elevations, heavy snow and ice. In the fall, raging hot Santa Ana winds race through the canyons, spreading fires started by careless or malicious humans or by the dry lightning storms that sometimes form over the higher peaks. Before European colonization the Native Americans also often lit fires as part of their land management practices. The deep canyons that slice down the face of the mountains support cottonwoods, willows,and alders. The high, snowy peaks offer habitat for ponderosa, Jeffrey, sugar, and coulter pines as well as white fir and incense cedar. Mid- elevation steep slopes and gullies that face north support live oaks and bigcone Douglas-fir, which is a special species of Douglas-fir that tolerates fire and drought. Above: a view of the San Gabriels in the distance, as seen from the San Bernardino Mountains. The latter range supports more pine forest than the former, but is still a rather dry ecosystem. About 80 percent of the land of the San Gabriels don't support trees at all, but instead a diverse dense scrubland known as chaparral. This ecosystem is incredibly resilient to fire, Dought, and shallow soils. It also holds the slopes up. 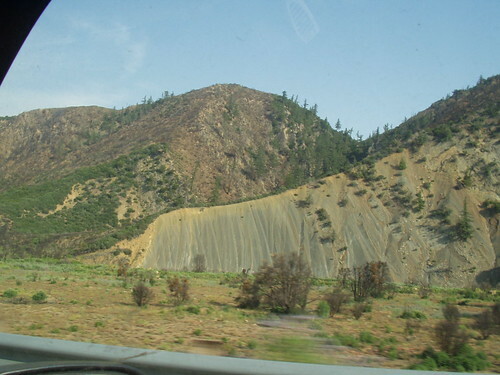 When it is temporarily knocked back by fire, any downpour or small earthquake sends mudslides or rockslides down the hills, though the surviving roots of many species still hold the soil. When chaparral is displaced by invasive species or removed, the mountains literally collapse. The San Gabriels are one of the youngest and fastest rising mountain ranges in the world - the San Andreas fault runs right along the northern slopes and with every earthquake the mountains rise a bit more. 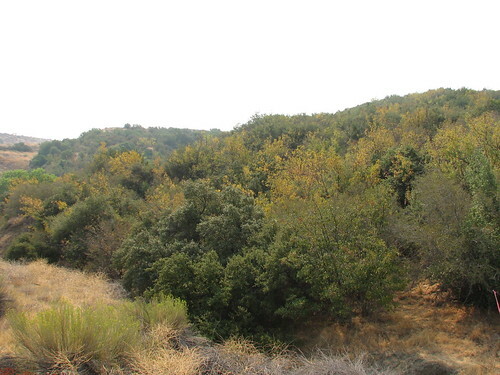 Above: a hillside covered in a chaparral 'forest'. This hillside supports small ash and oak plants; both are descendants of larger trees and over tens of thousands of years have decreased in size to adapt to harsh, dry conditions. A few years ago a huge fire ripped through the mountains, and killed a bunch of trees. This includes naturally occurring trees as well as some plantations that were planted years ago at lower elevations. The Forest Service got a grant from Mobil of all people to 'replant' the mountains. Planting trees is good, right? Well... the situation is complicated. Some believe that the fire was more intense than it would have naturally been, because of fire suppression or climate change. Perhaps the trees won't return on their own. Perhaps by planting the right type of tree, we can speed up the recovery process. Perhaps. Above: black oak leaves sprout from the base of a tree killed by a very intense fire. California oaks, including chaparral scrub oaks, are amazingly resilient to fire. We'll never know because the right trees weren't planted. Most of the little trees that were planted came from other mountain ranges, with different climates and soils. Some have claimed that trees were also planted too low in elevation, where it is too hot and dry. There was also an element of bad luck - it was a dry year. The result? Most of the trees have already died, and the long dry season is only starting. Maybe it's just as well. Coulter pines, which were planted in high densities, naturally occur in low densities, and the plantations from the 1960s that were hit by this fire burned furiously. 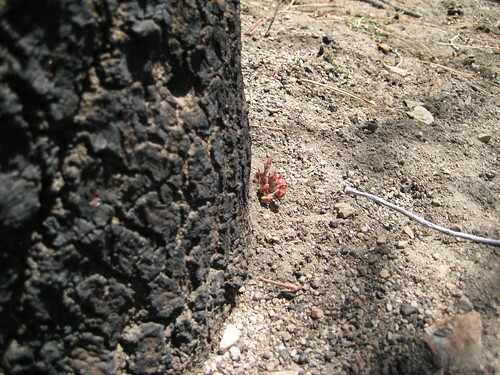 I also noticed tree planting happening in the San Bernardino Mountains, where a fire almost destroyed our family cabin. This particular fire was unusually intense due to bark beetles having killed pine trees. The main reason this happened was the pine forest was TOO DENSE due to fire suppression. The fire burned through dead and dying overpopulated pine trees and while we were lucky, many others lost their cabins and homes. So why is it a good idea to REPLANT dense pine trees in this same area? 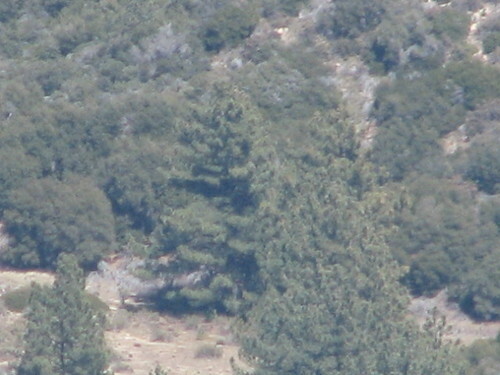 Above: a pine plantation (of introduced Canary Island pine) in the San Gabriel Mountains. Note that the chaparral has been cleared from around the trees, leaving a weedy mess. Note also the odd shape of the trees - this resulted in them burning despite 'fuel control'. The most ridiculous thing about this whole fiasco? People were seriously promoting the idea that trees had to be planted because otherwise the chaparral would 'choke the trees'. Just a few paragraphs before was the assertion that the fire was so severe it killed all the plants including the seeds in the soil. If this were the case, where would chaparral even come from to 'choke' the trees? Furthermore, if chaparral were able to outcompete trees, why hasn't it already done so? It's had countless centuries of fires, drought, and floods to work with. If the chaparral choked any forest, it was probably 10,000 years ago when the wetter Ice Age climate was ending. Since then, it's simply surviving where the trees can't. Planting trees and 'weeding' away chaparral near them is not only putting the wrong kind of medicine on a burn wound - it's actually ripping off the band-aid as well. Above: after a fire in the Los Padres National Forest, bigcone Douglas-fir still stands on the ridges, resprouting where foliage was singed; patchy chaparral recovers on the drier slopes. The 'badland' area in the center of the photo is naturally bare, but it's an example of how much erosion can happen in areas without chaparral. 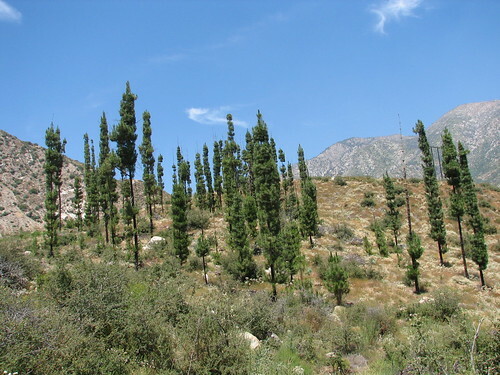 Bigcone Douglas-fir, the only appropriate conifer to plant in the southern San Gabriel Mountains below 4000 feet, is an incredibly shade-tolerant species that actually grows THROUGH chaparral, after being sheltered from the hot sun by said shrubs. Coulter pine also often grows right up through dense chaparral. If anything, the trees eventually 'choke out' the chaparral, but if they are naturally regenerating trees, this is a natural process, not a bad thing. This is why on the wetter, moister north slopes where fires are less intense, you eventually end up with neat stands of bigcone Douglas-fir. I think there is a legitimate case to be made that bigcone Douglas-fir distribution is decreasing due to frequent fires, and it makes sense to plant a few seedlings grown from locally-collected seed. I don't think it would be a bad idea for people to crawl up under the chaparral and plant some bigcone Douglas-fir seedlings under its shade during a cool November day. Of course, that isn't what happened. Trees were planted in the open, and lovingly 'weeded' and 'loved to death'. 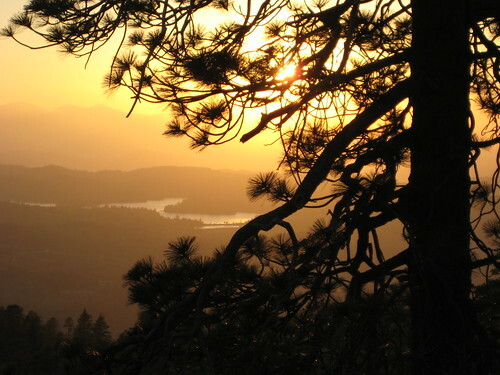 Above:Coulter pines in the San Gabriel Mountains living in 'peace' with chaparral. This is an extremely remote area - no one planted these native Coulter pines or 'protected' them as they grew. They simply thrived in the habitat they are adapted to live in. The moral of this whole rant? Restoration and reforestation are great when applied with a realistic understanding of how the ecosystem you are trying to restore works. However, RE-forestation involves planting the type of trees that naturally occur in an area, using locally collected plant material. If you don't do that, you lose the 're'. If you plant trees in wild ecosystems out of their natural range, because you like trees, at best you are wasting time and money. At worst, you are performing an arrogant act of 'nature gardening' that will lead the area into worse fire danger in the following decades, reduce a diverse ecosystem to a monoculture, and/or release another invasive species. In many cases, chaparral is the natural vegetation in southern California, and if you don't like it for some reason, well, you can ask yourself if you dislike it more than having a flood or rockslide destroy your home. If you answer yes, you should probably move to a different state. Not Vermont though, please. 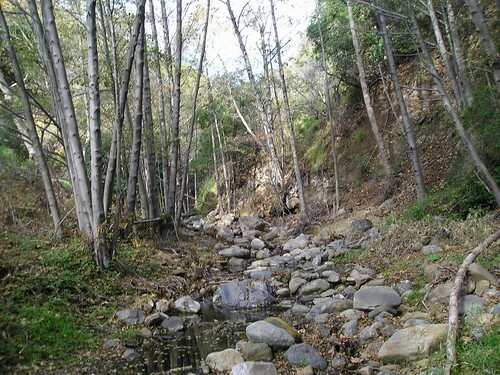 Above: this creek, in the Santa Monica Mountains, is lined by alder trees. Such trees also line many creeks in the San Gabriel Mountains. They are killed by fire and also often washed away by floods, but are very fast-growing and quickly recolonize impacted areas. It's been quite a dry few months here in Vermont. Many areas experienced at least an inch less precipitation than average; some much more so. After enduring the wettest calendar year on record last year, it seems like quite an abrupt change. The above map, issued by the Burlington, Vermont National Weather Service, shows an interesting pattern. The areas most hard hit by Irene and other flooding events last year - the Green Mountains in the southern and central parts of the state - are largely the areas most hard hit by this dry weather pattern. For the time being, I haven't heard of any ill effects except for increased fire risk. However, if the dry weather pattern persists into the growing season, it may negatively impact trees and cause problems for farmers. Dry times in Vermont are an odd thing. In southern California, a dry year means essentially no rain - a winter rainy season of just a few passing showers (still often torrential even if brief, and seemingly often passing at night) followed by a summer of absolutely no rain whatsoever; a trial of waiting with no hope of reprieve until perhaps the next rainy season. Even that holds no true promise, as dry years tend to string together. Above: the feeble snows of this winter have continued to sporadically dust Vermont into the Spring. Dry spells in Vermont are different. For one thing, they are usually measured in terms of weeks or months instead of years. Secondly, it still rains and snows. We've had unfulfilling drizzle, sleet, brief downpours, and non-accumulating snow flurries many times in the last two months. 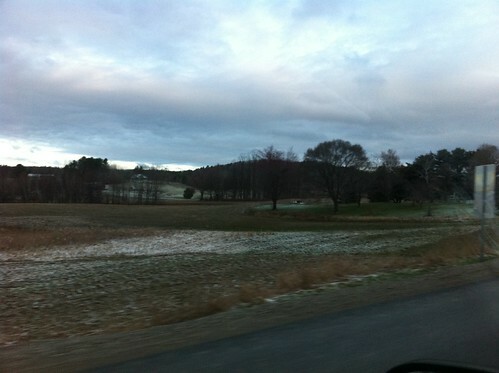 After essentially losing their entire snowpack in the March heat wave, the Green Mountains are again frosted with snow. It's just that there hasn't been a lot of it. 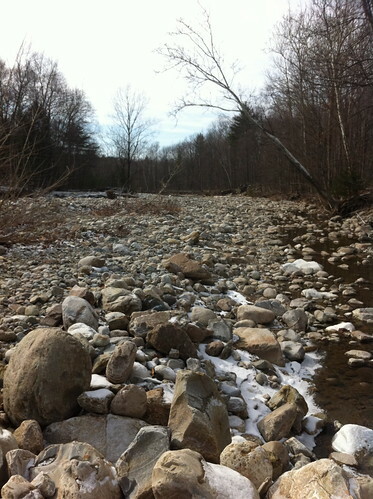 The Middlebury River is about as low in level as it was during a brief dry spell last July - with one difference. 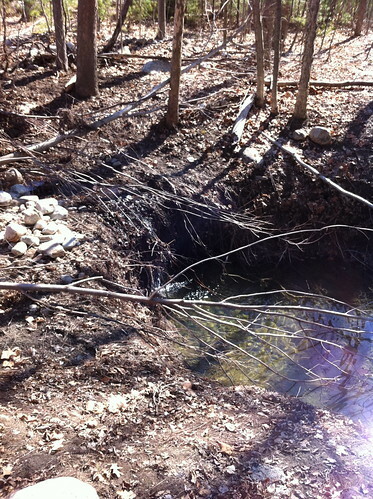 In early April, trees aren't aggressively taking up water and lowering the water table like they do in July, and there has been little sunshine and no heat to increase evaporation, either. If the dry period continues for another month or two, I'd except the river to drop even more when the trees leaf out. Above: the same section of river photographed during the July 2011 post linked above. 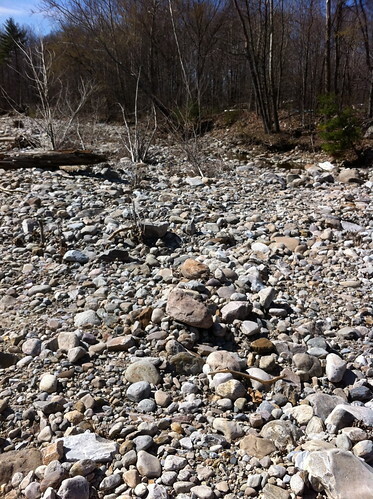 The water level is not directly comparrable because Irene and subsequent actions by the City of Middlebury has altered how water flows through this area. Still, this side branch of the river is nearly dry, and the main part of the river is almost low enough to boulder-hop across. I'd been expecting this oxbow cut to burst through during Spring flood - but we haven't had one! Meanwhile, I've been dealing with a nasty flu and fever the last few days. Apparently the fever has dried me out as surely as the Vermont hills this last month, and now I'm taking fever reducing medicine and drinking Gatorade to reduce my dehydration. I think it's fascinating how humans (and other animals) are largely composed of water... and that reducing the amount just a little can cause problems. In any event... hopefully I feel better soon. On a much broader note, evidence has been mounting that the lack of sea ice the Arctic has been experiencing lately has been a factor in increasing jet stream fluctuations that cause weather extremes, especially cold and snow. It seems a bit counter-intuitive that less ice in one place means more snow and cold in other places, but if you read through this post by meteorologist Jeff Masters, or look back at a post i made about the subject last year, it does make sense. The atmosphere is incredibly complex and affected by many factors, which is sometimes used as an argument that humans don't affect the climate. The truth is, it's near-certain that we do have a significant effect, but it is immersed within many natural factors as well. It may be that our warming of the climate melts Arctic ice and causes a feedback loop that throws much of the Northern Hemisphere into a cold period. The climate is incredibly complex, and this means any effect we have may be amplified or distorted in odd ways. In addition to working to reduce our impact, we need to understand and study all kinds of climate change so we can prepare for them as best we can. Just a little over a week ago, Vermont (like most of the northern US) experienced by far the warmest March weather on record. Temperatures surged over 80 (f) at times, and many plants decided to take the gamble and start growing early. Then the bottom fell out. The cold snap was nothing out of the ordinary - temperatures dropped to 22 degrees in Burlington, nowhere near mid March record lows which run in the single digits. However, because of the incredibly warm temperatures of the previous week, it was quite a shock. The cold front that brought this colder air mass blew through in the wee hours of the morning of March 26. The wind rattled the windows and woke me up, and there was a brief shower of graupel and snow. The drive to my first day of work featured a light dusting of snow on top of recently plowed (but not planted) fields and newly blooming flowers.